Sport of kings, that's the way thoroughbred horse racing is described. But that moniker seems less related to regal breeding and high-society cliques than it does to the size of the bankroll you need to enjoy this sport in style. If you're part of the two-dollar-window crowd, SportTime's Horse Racing gives you the chance to try your handicapping skills without risking your wallet and redefines the phrase off-track betting. Enjoy a day at the races without affecting your wallet as you play Horse Racing. Horse Racing is designed to offer players an expandable game format through use of software modules. With the original package, you receive the Handicapper's Tournament and the Track 1 disks. If, after you've played the game for a while, you want to discover other aspects of horse racing, you can buy separate disks to add to the original system. So far, SportTime has released two supplementary disks: Track 2 and Stable Owners. The Handicapper's Tournament is a competition between you and 19 other racetrack rounders. Up to four humans can play; the program generates its own bettors to make up the 20. All players start with the same amount of money, and you can set the skill level to Easy, Normal, or Hard. The game ends after one of three criteria that you define is met: A certain number of races are run, a certain number of race bets are made by each player, or one of the bettors reaches a predefined dollar amount. Once you've established the ground rules, it's time to head for the track and the game's main menu. To begin play, select Entry Information; you'll move to a screen that resembles the program at many tracks. Here's where you can see the names of the horses and their jockeys, the number of times they've finished in the money, the total number of races each horse has run, the track conditions, the post positions, and the odds. This information, while helpful, doesn't go too far in picking a winner. For that you need the the racing form. This game compiles its own cumulative collection of stats on each horse, which you can see by highlighting the horse's name and pressing the Enter key or by using your joystick. My only complaint about the game concerns its lack of mouse support; if there ever was a game that begged for a mouse, this is it. SportTime should offer a mouse-support upgrade in the future. Reading the racing form takes practice, but you can pick it up pretty easily with Horse Racing's version. In this game you have a Past Performances screen that, if used wisely, can give you a very definite edge over the other bettors. Back at the main menu, you move to the betting window. 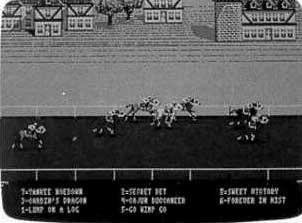 This was the most difficult part of the game for me because as a kid I lived near Keeneland, a small and very traditional racetrack in Kentucky where the most exotic bets allowed were the daily double and six-dollar combination. In Horse Racing, I could choose not just from the normal win, place, or show bets, but also from such strange breeds as the quinella, exacta double, triple box, and more. Fortunately, the manual explains these exotic wagers pretty well. If you're stumped on a bet, and you have a least $100, you can buy a tip from one of the computer handicappers. The cost of the tip relates directly to the handicapper's success at the window, but not always to the bet that the handicapper will place on that race. Select Run Next Race from the main menu and you're transported to the grandstand. The track and the horses are rendered in CGA graphics, but don't set yourself up for disappointment. To their credit, the game's designers have made good use of the four-color palette. The result is a detailed and attractive view of the race-course. (SportTime's Track 2 module sports EGA graphics.) The running horse figures give way to numbers when the horses are in a turn, but you shouldn't find that too distracting. I couldn't believe how well Horse Racing captures the feel of a real day at the track. The entry information is a gold mine for stat nuts, the competition among handicappers is fierce, and the races are exciting and extremely realistic. What's more, by compiling a history of statistics for each horse and rider, the game becomes even more lifelike as you continue your parimutuel betting adventure. It's hard to explain the thrill of horse racing to those who have never participated, but this game provides a satisfying glimpse into what the thoroughbred world is all about. The program wins high praise for its meticulous detail, imaginative use of graphics, realistic play, and thoughtful modular structure. It's a sure bet for the winner's circle.